Placing architecture in its ecological framework, reveals the various networks to which it belongs and retrieves a more complete cultural dimension, becoming a quasi-object, an hybrid inhabitant of the Ecosphere. 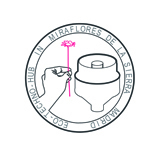 The old sewage treatment plant (1965) is now a nature reserve located within the protected space of the sheep track and the Guadalix River basin. The construction of a new treatment plant after the population’s growth in the 80s turned this plant obsolete, and since the 90s it works as a nursery for the regional government reforestation plans. This place is also used for environmental education activities for public and private entities. Its demolition was discarded for both economic and ecological reasons, since rehabilitating saves resources and extending its life, reduces its ecological footprint. Eco TechnoHub is a phase of inevitable entropic continuous transformation process to which every human work is subject; it celebrates this transformation and gets incorporated into it, recognizing itself as an active part. From a renewed awareness and an inclusive attitude, architecture is conceived beyond its disciplinary autonomy to produce an artifact sensitive to its environmental impact. EcoTechnoHub is a prototype that shows the advantages of creative reuse (Upcycling) of the built environment, making it useful, educational and accessible to the public. It strengthens and enhances the ecological and educational agenda of the current nursery, implementing simple operations that place value on this infrastructure, formed by the ‘bacterial filter bed’ tank and the underground deposit. 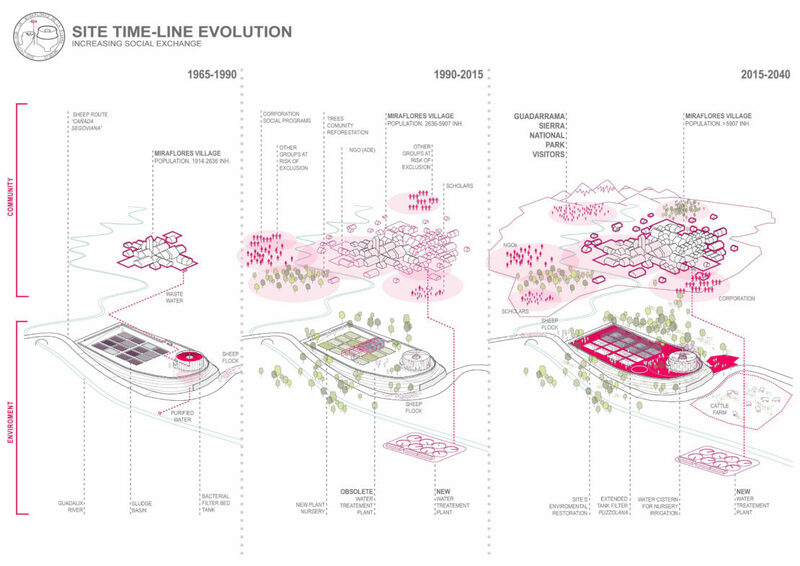 The proposal results from emptying the infrastructure and inserting new components, revealing and conditioning spaces designed not to be inhabited. [OUT]: Emptying the tank reveals an air-and-natural-light-filled space. The filtering volcanic gravel is spread across the site as a pavement. Emptying the underground deposit reveals a dark, deep and compartmentalized space, suitable for exhibitions and projections. Sludge is used as fertilizaer and water for irrigation. [IN]: A light umbrella-shaped structure is inserted with 2 tensioned membranes, solidary with the bicycle-wheel roof. A network of cables ties the roof to the tank’s perimeter, serving as its ballast and providing support for climbing plants. The mast supports the roof and concentrates the technology for harnessing renewable energy (geothermal, wind, sun) required to operate the Hub. It also supports the spiral stair communicating the underground with the lookout point; a tunnel of concrete rings is inserted to provide access to the subterranean deposit and to a new gridded floor, on which visitors will be suspended to experience its depth. The new access provides flexibility of use and management, allowing schedules and activities. EcoTechnoHub is self-sufficient and didactic: it consumes less power than it generates, and makes use of it as part of its environmental education program. It is a place where communities and ecosystems will be related, assembling neighbors and visitors to the National Park, sheep flocks and new forests born in the nursery. It is a support for life and promoter of biodiversity. EcoTecnoHub is the result of ReAssembling –as a means for architectural invention- an existing infrastructure and a new light structure, obsolete and current technologies, inert and living matter. 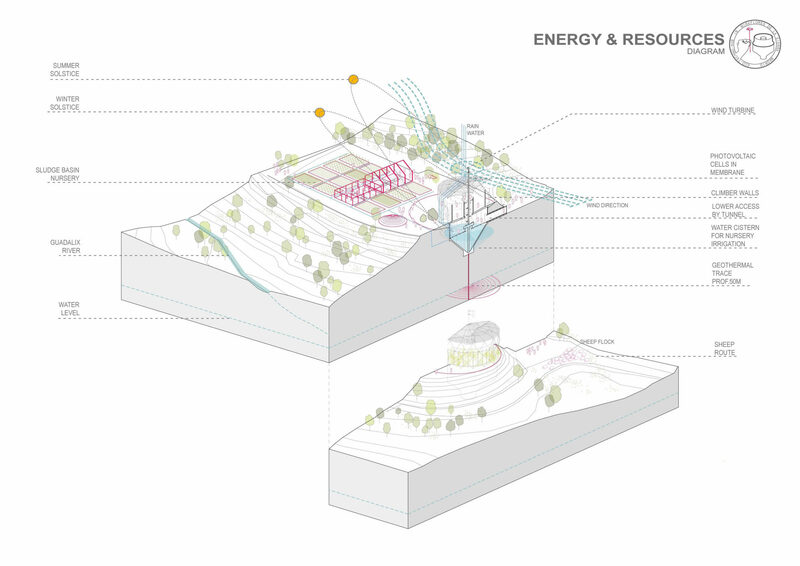 EcoTecnoHub integrates infrastructure and architecture, communities and ecosystem, landscape and peasantry.